Cake: Preheat the oven to 325°F. Grease a 9-inch mold and line with parchment paper, grease and flour the paper and the sides of the mold. Combine the chocolate and butter in a small pot. Cook over very low heat, mixing once in a while until you acquire a uniform mixture. Turn off the heat and let cool to room temperature. Lightly beat the eggs in a bowl with a whisk until well mixed. Add the melted chocolate, flour, salt and vanilla. Combine with the help of a spatula until uniform. Pour the dough into the mold and bake for 1 hour or until the cake looks curdled and slightly swollen in the middle. Cool on a rack. Once it’s warm, remove from the mold on to a dish and remove the parchment paper if stuck to the base of the cake. Let cool completely. Ganache: Heat the cream in a small pot over medium heat with the butter and glucose. Let boil. Turn the heat off and add the chocolate. Let sit for a few minutes and then use a spatula to softy stir from the middle until its shiny and smooth. Let cool for a few minutes and pour over the cake, spreading with a spatula. Let cool completely. Decorate with blackberries and mint leaf. Serve in small portions. Use milk chocolate if you prefer, you can also make this cake with white chocolate but it will be sweeter. You can decorate with flowers or any other type of fruit. 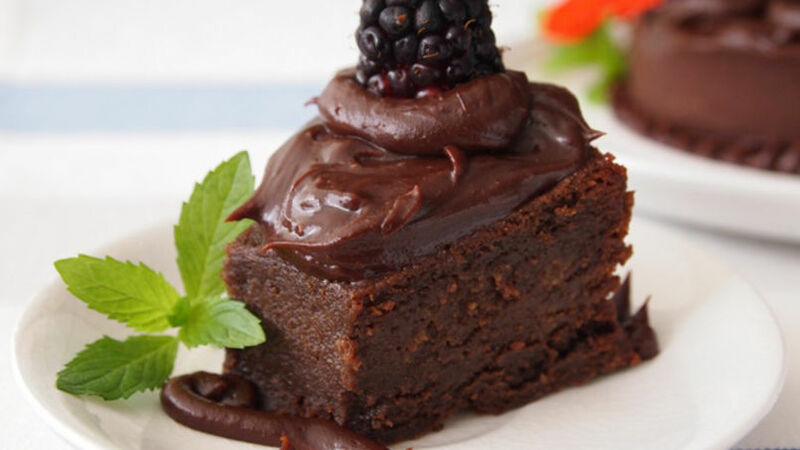 If you’re looking for a chocolate cake with intense flavor and an exquisite creamy texture, then this recipe is for you. The prep time is short and you don’t need a hand mixer to make it; baking and cooling the cake is what takes the most time. Since I’m always looking for new ways to play with ingredients, you can replace the regular flour with almond flour and instantly turn this chocolate cake into a piece of gluten-free art, perfect for those who have a hard time with gluten but don’t want to give up chocolate cake. The best part of this recipe is that you can refrigerate it for up to 3 days in a vacuum-sealed container so that it doesn’t absorb any strange smells. Before serving it you should leave it out at room temperature for about 20 minutes so that it gets soft and creamy again. This cake is so intense that a small portion is enough to satisfy any chocolate cravings. To make the process a little easier, you can make the ganache the day before and once it’s cool you can move it to the refrigerator in a well-sealed container. But, if you really have a serious sweet tooth, you can top it off with blackberry sauce or custard. I love custard so much I could eat it by the spoonful, but that’s a different story. How do you like your chocolate cake?